A hardware emulator is an emulator which takes the form of a hardware device. Examples include the DOS-compatible card installed in some 1980s-era Macintosh computers like the Centris 610 or Performa 630 that allowed them to run personal computer (PC) software programs and FPGA-based hardware emulators. In a theoretical sense, the Church-Turing thesis implies that (under the assumption that enough memory is available) any operating environment can be emulated within any other environment. However, in practice, it can be quite difficult, particularly when the exact behavior of the system to be emulated is not documented and has to be deduced through reverse engineering. It also says nothing about timing constraints; if the emulator does not perform as quickly as the original hardware, the emulated software may run much more slowly than it would have on the original hardware, possibly triggering time interrupts that alter behavior. Many emulators have already been developed and released under GNU General Public License through the open source environment, allowing for wide scale collaboration. In contrast, some other platforms have had very little use of direct hardware addressing. In these cases, a simple compatibility layer may suffice. This translates system calls for the emulated system into system calls for the host system e.g., the Linux compatibility layer used on *BSD to run closed source Linux native software on FreeBSD, NetBSD and OpenBSD. For example, while the Nintendo 64 graphic processor was fully programmable, most games used one of a few pre-made programs, which were mostly self-contained and communicated with the game via FIFO; therefore, many emulators do not emulate the graphic processor at all, but simply interpret the commands received from the CPU as the original program would. Developers of software for embedded systems or video game consoles often design their software on especially accurate emulators called simulators before trying it on the real hardware. This is so that software can be produced and tested before the final hardware exists in large quantities, so that it can be tested without taking the time to copy the program to be debugged at a low level and without introducing the side effects of a debugger. In many cases, the simulator is actually produced by the company providing the hardware, which theoretically increases its accuracy. Math co-processor emulators allow programs compiled with math instructions to run on machines that don't have the co-processor installed, but the extra work done by the CPU may slow the system down. If a math coprocessor isn't installed or present on the CPU, when the CPU executes any co-processor instruction it will make a determined interrupt (coprocessor not available), calling the math emulator routines. When the instruction is successfully emulated, the program continues executing. Various forms of dynamic recompilation, including the popular Just In Time compiler (JIT) technique, try to circumvent these problems by waiting until the processor control flow jumps into a location containing untranslated code, and only then ("just in time") translates a block of the code into host code that can be executed. The translated code is kept in a code cache, and the original code is not lost or affected; this way, even data segments can be (meaninglessly) translated by the recompiler, resulting in no more than a waste of translation time. Speed may not be desirable as some older games were not designed with the speed of faster computers in mind. A game designed for a 30 MHz PC with a level timer of 300 game seconds might only give the player 30 seconds on a 300 MHz PC. 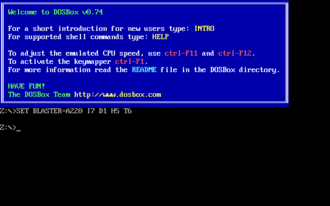 Other programs, such as some DOS programs, may not even run on faster computers. Particularly when emulating computers which were "closed-box", in which changes to the core of the system were not typical, software may use techniques that depend on specific characteristics of the computer it ran on (i.e. its CPU's speed) and thus precise control of the speed of emulation is important for such applications to be properly emulated. In 1963, when microcode was first used to speed up this simulation process, IBM engineers coined the term "emulator" to describe the concept. In the 2000s, it has become common to use the word "emulate" in the context of software. 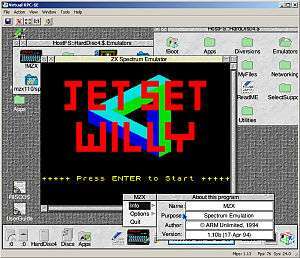 However, before 1980, "emulation" referred only to emulation with a hardware or microcode assist, while "simulation" referred to pure software emulation. For example, a computer specially built for running programs designed for another architecture is an emulator. In contrast, a simulator could be a program which runs on a PC, so that old Atari games can be simulated on it. Purists continue to insist on this distinction, but currently the term "emulation" often means the complete imitation of a machine executing binary code while "simulation" often refers to computer simulation, where a computer program is used to simulate an abstract model. Computer simulation is used in virtually every scientific and engineering domain and Computer Science is no exception, with several projects simulating abstract models of computer systems, such as network simulation. Video game console emulators are programs that allow a personal computer or video game console to emulate another video game console. They are most often used to play older 1980s-era video games on 2010s-era personal computers and more contemporary video game consoles. They are also used to translate games into other languages, to modify existing games, and in the development process of "home brew" DIY demos and in the creation of new games for older systems. The Internet has helped in the spread of console emulators, as most - if not all - would be unavailable for sale in retail outlets. Examples of console emulators that have been released in the last 2 decades are: Dolphin, PCSX2, PPSSPP, Zsnes, Kega Fusion, Desmume, Epsxe, Project64, Visual Boy Advance, NullDC and Nestopia. Vernor Vinge's 1999 novel A Deepness in the Sky depicts a human interstellar culture that relies on software written over five thousand years, some from "before Humankind ever left Earth". Its computers still "can run most of them" through "a million million circuitous threads of inheritance ... layers upon layers of support". "Down at the very bottom" of the culture's "incredibly complex" timekeeping systems, for example, "was a little program that ran a counter [from] the 0-second of one of Humankind's first computer operating systems". Programmer-archaeologists find and modify old software written hundreds of years ago (one character states that "all of them are buggy") to solve modern problems. ↑ Rothenberg, Jeffrey (1998). ""Criteria for an Ideal Solution." Avoiding Technological Quicksand: Finding a Viable Technical Foundation for Digital Preservation.". Council on Library and Information Resources. Washington, DC. Retrieved 2008-03-08. ↑ Muira, Gregory." Pushing the Boundaries of Traditional Heritage Policy: maintaining long-term access to multimedia content." IFLA Journal 33 (2007): 323-326. ↑ Egan, Matt. "Buy Xbox One, stick with Xbox 360 or grab a bargain by buying and Xbox 360 new?". PC Advisor. Retrieved 2016-05-30. ↑ Vinge, Vernor (1999). A Deepness in the Sky. Tor. pp. 224–227. ISBN 9780812536355.